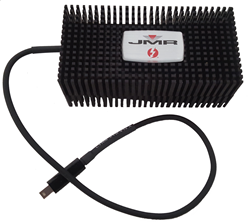 JMR Electronics, Inc. a leading manufacturer and systems integrator of scalable storage solutions announced today the general availability of their new Lightning™ LTNG-XTD portable Thunderbolt™ SSD Flash Drive. The ultra-compact PCIe Flash Drive with Thunderbolt 2 interface is a portable bus-powered drive requiring no external power source, and is introduced with 256GB storage capacity, with 512GB and 1.02TB models being added in the future. The new SSD drive is the ideal high performance alternative to USB thumb drives, portable SATA based hard disk drives, and current SSD storage products in the market. It easily connects to a compatible Mac® or Windows computer with a Thunderbolt port, or at the end of a Thunderbolt device daisy chain, via its attached Thunderbolt cable. JMR is a leading value provider and systems integrator of scalable storage systems for high performance and capacity driven applications for multiple markets including; video and post-production, military and government, education, VOD, DCC, gaming, security, medical imaging, HPC and Web 2.0. Since 1982, JMR’s reliable and innovative RAID systems are proudly made in the U.S.A., manufactured entirely from their Chatsworth, California facilities. JMR’s complete line of affordable Lightning™ storage products; SilverStor™ SMB focused products, and BlueStor™ Cloud-ready rackmount and desktop solutions are built to handle the most demanding project needs for A/V centric markets. Reliability. Innovation. Performance. This is JMR. For further information please visit http://www.jmr.com or contact sales(at)jmr(dot)com, or call 818-993-4801.